At least one out of every six children in the UK lives in relative poverty, according to data released by the Department for Work and Pensions. In 2011-12, 2.3 million UK children (17%) lived in homes with substantially lower than average income. This rises to 27% (3.5 million) if measured after housing costs are paid. Children's campaigners say the true figure is higher and that 300,000 more children live in poor homes than in the previous year. This is because there are two accepted ways of measuring poverty - relative and absolute. The government prefers the measure of relative poverty - defined as when families have a net income that is below 60% of "median net disposable income" - as does Labour. This amounts to £250 a week or less at the moment. Using this, there was no change on child poverty and the number and proportion of working-age adults in relative poverty also remained at about the same level. But the number living in absolute poverty is higher and on this measure, one in five children in the UK lives in poverty - a total of 2.6 million in 2011-12. On this measure, 300,000 more children fell below the poverty line compared with the year before. The absolute measure of poverty differs because it is adjusted for inflation. Campaigners say the reason the headline figure has remained stable is because incomes are falling in the recession. The government says the statistics show that compared with last year, 100,000 fewer children are living in "workless poor families". The proportion of working-age adults living in relative poverty is also about one in six (5.6 million) if income is calculated before housing costs are paid - the government's preferred way of measuring relative poverty. This rises to one in five (7.9 million) if the other measure is used. A similar proportion of pensioners were living in relative poverty in 2011-12 - 1.9 million. The coalition government has made a pledge to end child poverty by 2020. Between 1998 and 2011-12, the number of children in relative poverty in the UK fell by about one million. Work and Pensions Secretary Iain Duncan Smith said the government's aim was to get children out of poverty by getting more people in to work. "While this government is committed to eradicating child poverty, we want to take a new approach by finding the source of the problem and tackling that. We have successfully protected the poorest from falling behind and seen a reduction of 100,000 children in workless poor families," he said. "Today's figures underline the need for better measures of child poverty that are not so heavily dependent on where we draw the poverty line." But children's campaigners say the true picture is worse than the government figures suggest and that the children moving in to the poverty bracket are in families where people are working. 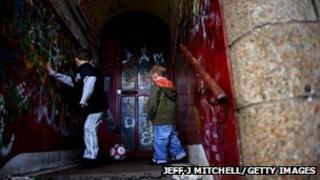 Matthew Reed, the chief executive of the Children's Society, said the statistics painted " a depressing picture". "There are now 2.4 million children in working households living in absolute poverty - an unacceptable truth about life in Britain today," he said. "Latest figures also reveal that in the first full year of the coalition government, 300,000 more children faced a real fall in living standards that pushed them into absolute poverty. The entire increase is from homes where parents are working." Liam Byrne MP, Labour's Shadow Work and Pensions Secretary, said: "The devastating verdict is in - in just one year this government has pushed a million people into absolute poverty and progress in tackling relative child poverty has completely stalled. "All of Labour's good work in tackling poverty is being washed away by a Tory cocktail of incompetence and indifference. "What these figures show is living standards are collapsing to their lowest level in a decade, and that is forcing an extra 300,000 children to grow up in absolute poverty." Fiona Weir, head of the single-parent charity Gingerbread, said it was alarming to see one in three children with a single parent who worked part-time was living below the poverty line. "Government claims that work is the best route out of poverty are simply not ringing true," she said.